A controversial gun law took effect on October 1. It lets people with concealed permits carry their handgun into bars and restaurants that serve alcohol…as long as they don’t drink any. Owners of restaurants and bars that don’t want guns in their business must post a sign. And those who have posted signs have drawn the ire of the gun-rights group Grass Roots North Carolina. 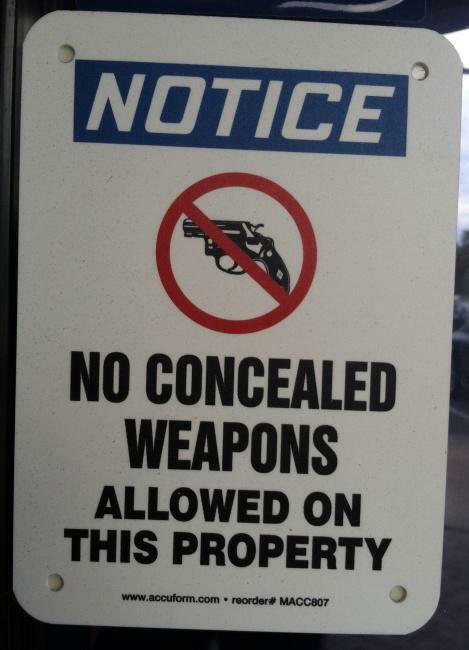 GRNC is listing on its website restaurants that post these no guns signs. The group doesn’t want gun owners to patronize these restaurants. But don’t call it a boycott, says GRNC president Paul Valone. Valone: We’re not trying to boycott a restaurant. What we’re trying to do here is to get them to remove signs, so that people can protect themselves. People are encouraged to contact those merchants to let them know that because they cannot protect their families in those places, they will be unable to patronize their establishment. Kevin: Among the restaurants listed on the site are most Buffalo Wild Wings, The Fox and Hound in Huntersville, and the Rock House Tavern in Gastonia. The movie theater at Concord Mills even made the list. All of these, he says, are high risk businesses. Grass Roots North Carolina website. Valone: Places which post against concealed carry, actually attract violent criminals and sociopaths. These are “victim disarmament zones.” And so we are telling people that this restaurant is posting a sign which may actually place you and your family at risk. Kevin: The reason being, if you don’t have a gun, you can’t protect your family. The Smokin’ Cue pool hall in Charlotte is another business on the list. Owner Matt Riggs didn’t know he was on the list, and kind of shrugged his shoulders at the news. He decided to post the sign because of an incident when a customer with a concealed permit illegally brought his gun into the business. Riggs says he has no intention of taking down his sign. Riggs: I haven’t had anyone complain to me, that is a concealed weapon carrier, complain to me that we have the sign up. I’ve had a handful of people – five to seven people – come up to me prior, and since the law was enacted asking if we were to put signs up. And when I said yes, that was the plan, they all said thank you. Kevin: In Fayetteville, BS Jones Pub and Grill is also on the list because of its no weapons sign. Hartzler: Weapons and alcohol don’t mix. Kevin: Owner David Hartzler agrees with Grass Roots North Carolina on one point: the chances of a permit carrying customer doing something wrong with his or her gun is slim. But why take the chance, he says. Plus he says there is further risk for all customers, even if the person with the gun is minding his or her own business. Hartzler: If you have a sidearm on you, and someone comes in and clubs you over the back with a beer bottle and takes your weapon, then I’ve got a problem. So you are bringing your own demise into the building.